This was my fourth and longest trip to the Big Apple. And while our days were full of meetings, calls, and work stuff, our nights were full of sightseeing fun. I still can’t believe how much we were able to fit in! So before I talk about all the food we tried, I have to say that my food pictures didn’t turn out as great as I had hoped. It just so happens that the lighting in small NYC restaurants isn’t as good as the food! Bill’s Bar and Burger – Don’t ask me how two vegetarians ended up at a burger joint. Sunday evening was kind of hectic, so we went with what was easy and available. I wasn’t a huge fan of this restaurant for a number of reasons. One, the service was a little slow. Two, the food was just average. We ordered nachos to share that were topped with nacho cheese sauce versus real cheese. This really bothered me for some reason. And the veggie burgers we ordered tasted like they came right out of the freezer – no seasoning at all! Europa Cafe – We wanted Sunday to be a little more go with the flow, and the lunchtime flow led us to Europa Cafe. While this is a chain restaurant, the food was pretty good. We shared a warm Greek quinoa salad and an avocado sandwich. Great healthy fare that was reasonably priced as well! Le Pain Quotidien – My boss, Bhusha, is from London, where this restaurant is known to serve fresh, delicious food. When she suggested we check it out, I was game. The ambiance is very rustic and community oriented with large tables/benches that seat numerous people. And the food didn’t disappoint either. 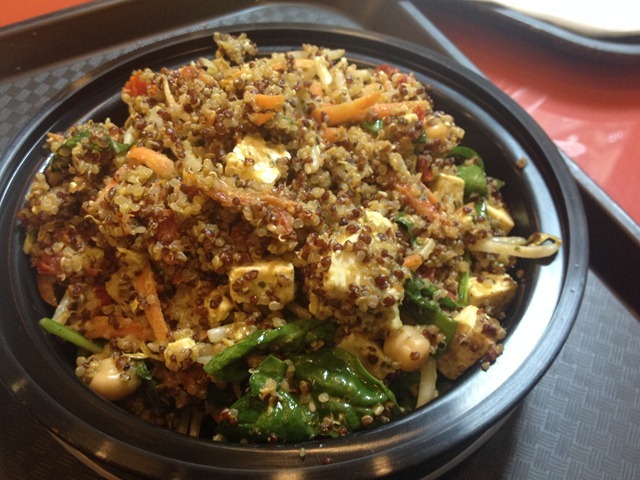 I ordered a Gruyere and spinach quiche, while Bhusha ordered a quinoa salad. Both dishes were delicious and very light. We also shared gluten free crackers topped with avocado mash. I loved how accommodating the menu was in terms of different food preferences. Anyone would be happy eating here! Hangawi – This was by far my favorite NYC restaurant that we tried. Everything from the food to the decor to the ambiance created an amazing dining experience. When you enter the restaurant, you take off your shoes. You are then led to your table which is set up like a traditional Korean house. The menu is 100% vegetarian Korean food with a healthy twist. We ordered a couple of appetizers – organic kale dumplings filled with tofu and combination rolls (so unique and flavorful). And for dinner, we both ordered organic bibimbap that came in a hot stone bowl. This is a must visit NYC restaurant that looks unassuming from the outside yet is anything but in terms of the food. Sinigual – This Mexican restaurant was located near our office so we headed here for lunch one day. I ordered a dish that included roasted veggies and a chili relleno that was stuffed with a cheesy corn mixture. The veggies were a bit oily but the chili relleno was amazing! We also got guacamole to share…always a good choice! Kati Roll – So we went to this place three times. THREE! I had it on the list of restaurants to try, so we went for dinner one night. My boss (and I) loved it so much that we went back for lunch two more times! Kati rolls are Indian flatbreads stuffed with a spicy mixture of either meat, chickpeas, paneer, or potatoes. So so good! I remember the rolls being a little oily from my last trip to the city, but I was pleasantly surprised to find that the rolls we had this time were not oily at all and actually tasted semi-healthy. 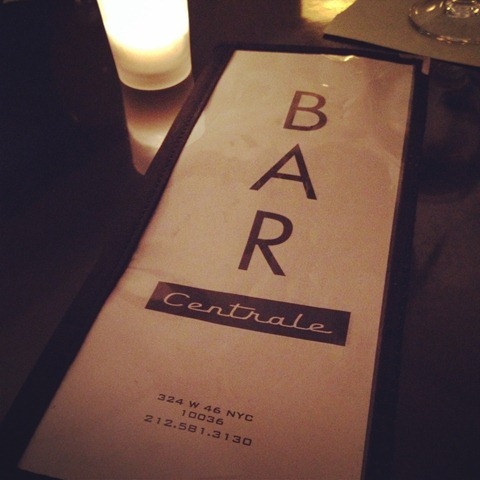 Bar Centrale – One of our coworkers recommended we eat here because it’s known to be frequented by celebrities. Well, we didn’t see anyone famous, but we did eat some delicious food. Bhusha and I shared guacamole, chickpea fries, flatbread pizza, and potato skins. The menu reminded me of a tapas menu filled with bar food. Good stuff! Times Square – Our hotel was really close to Times Square so we walked through several times. So much hustle, bustle, and energy! The Metropolitan Museum of Art – We spent a few hours on Sunday exploring the museum, and I felt like a kid in the candy store. Every piece I saw amazed me, from the Iron Age Spouted Jars to the Egyptian jewelry. I could have honestly spent all day in there! We were able to fit in a guided tour highlighting some of the main sections of the museum and a self-guided tour of the Lost Kingdoms exhibition. 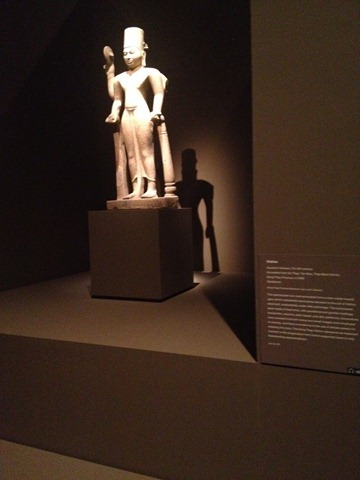 This special exhibition explored the Hindu and Buddhist kingdoms that flourished in Southeast Asia from the 5th to the 8th century. Absolutely fascinating! I got in trouble after taking this picture, which was strange because I saw tons of people snapping pics left and right! 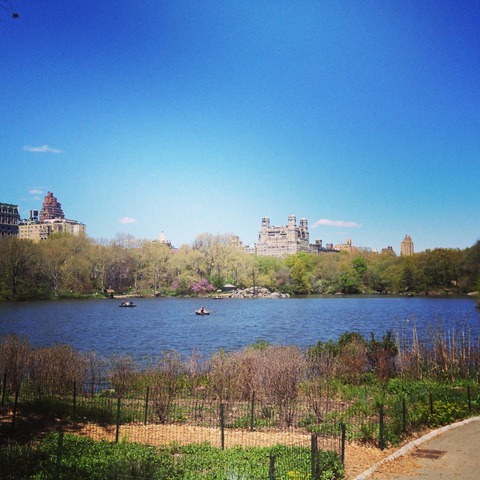 Walking tour of Central Park – Did you know that Central Park is 2.5 miles long and 0.5 miles wide? I didn’t either…until this tour! We walked across the 0.5 miles and learned all about how and why the park was commissioned and developed. Rockefellar Center Tour and the top of 30 Rock – This was a fun tour of Rockefellar Center, where we learned about the history behind the development of the buildings, gardens, and plazas. 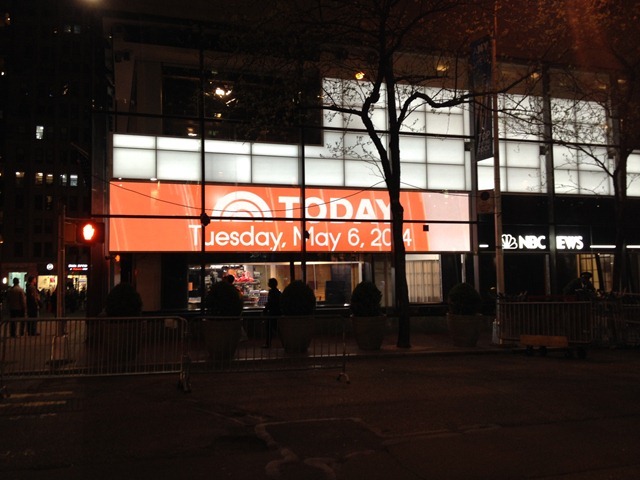 We even got an up close and person look at Studio 1A (home of the Today Show)! After the tour we went up to the top of 30 Rock where we experienced some of the most amazing views of the city! 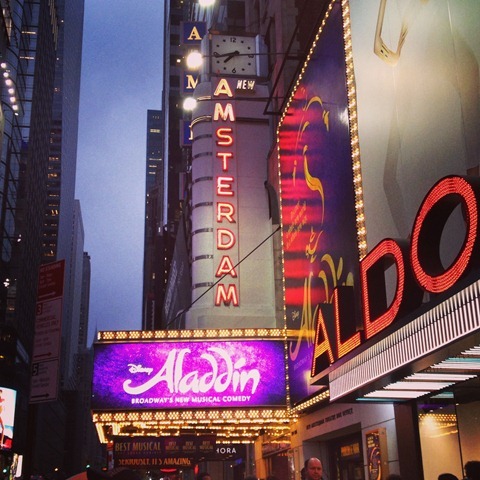 Aladdin on Broadway – THIS WAS THE ABSOLUTE HIGHLIGHT OF THE TRIP!!! You guys, if you have the opportunity to see Aladdin on Broadway, please do it. The show was SO funny, magical, romantic, and awesome. The actors, the set, the costumes, the music, the theater itself…ahh I want to see it again!! I was 10 years old when Aladdin was released, and I remember falling in love with everything about it. Watching it on Broadway brought back those same emotions. There are just no words to adequately describe how amazing it was! 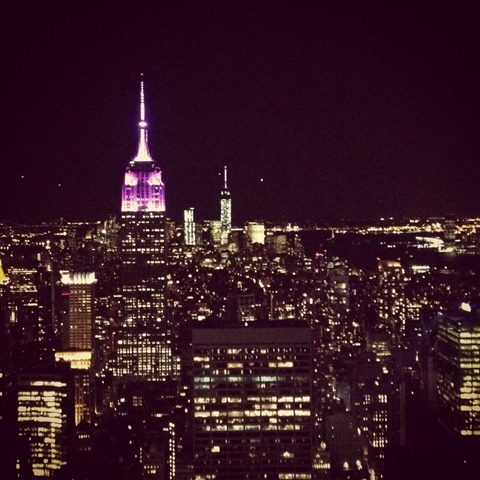 Well there you have it – my time in NYC in one very long blog post! Phew! Have you been to NYC? Favorite restaurant and/or sight to see? LOVE this post! I’ve been to NY but I was too young for it to count. I just started a NYC fund which I will hopefully put to use early next year…this post has made me want to go all the more! Believe it or not, there are a few LPQ restaurants here and fortunately they taste as delicious as in London! SO jealous you saw Aladin on Broadway…it’s definitely high up on my list of favorite Disney movies! And I hope you get to make it next year! The foodie in your would be in heaven! My best friend and I went to NYC to celebrate our 30th bdays this past fall. It was one of the best trips I’ve taken! Our favorite bar/night was the first night when we went to Le Bain which is the rooftop bar at The Standard Hotel in Chelsea. One of my favorite sights was the Highline walk on Chelsea, getting brunch there as well. Our favorite day was our picnic in the park and having a glass of wine at The Boathouse! Didn’t make it to the Met but we did do Guggenheim and MoMA! I loved that trip so much. We also had fun walking to the Friends building and Carries house in The Village! Glad you had fun!! That city is sooo fun!! So someone told us to go to the Highline but we didn’t have time! Man…next time for sure. How awesome that you got to celebrate your big 3-0 in NYC! I’m definitely taking a girls trip up there! Sounds like you had a blast Parita! My sis used to live in NYC and I visited her often then, If my memory serves me well, I think we have been to Kati Roll and it was very good – my fav restaurant /bakery was “Fabiane’s” in Brooklyn – they had the best chocolate soup and pistachio cake! Shashi @ RunninSrilankan recently posted…Mystery Ingredient Chocolate Freekeh Pancakes! Chocolate soup!? I was hoping we’d make it out to Brooklyn at some point but time just got away from us. Next time for sure! Ohh that Kati roll place sounds yummy! There are just so many places to try in a city like NYC that it’s hard to choose where to go! It was so hard! Everywhere you turn there’s a restaurant! I think I could spend years there and not try every place I wanted to…a food lovers dream for sure! Lived 3 blocks from Kati Roll…it was a problem! So jealous you had it!!!! P, you I need to delete you off my blog reader. You keep giving me NYC envy. Without a doubt, the best city in the world. I am KICKING myself that I was unaware of this amazing sounding thing called a Kati Roll- My favourite restaurants where in the East Village but I LOVED the food trucks- especially the Korean ones! We didn’t try any food trucks unfortunately! I definitely want to go back…just for the food! And you should see if any of the restaurants in AUS have kati rolls on the menu – you’d love it. A few people told us to try Grimaldi’s…ahhh next time! 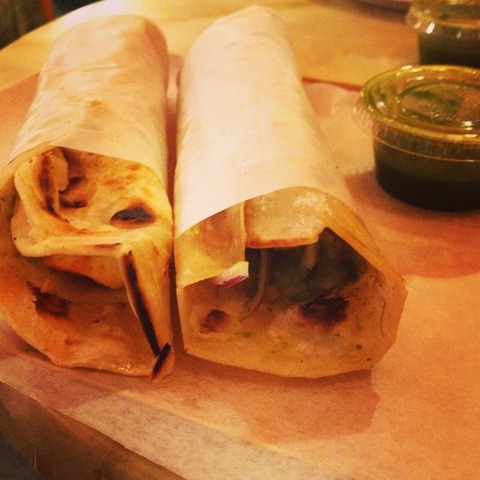 We love the Kati Roll place…I work very close to it and it’s really tasty. Sorry we didn’t get to see each other this trip, hopefully next time!